As you probably might have guessed from the title, the subject of this article is focused around UI/UX Patterns. Although I would like to dig a bit further into the patterns subject and talk especially for tools that create UI/UX Patterns like modals and overlays such as our Engage Box. Every webmaster's insisting problem is how to keep the conversion rate of his website high. There is a limited list of things that he can do before he ventures into tools that are best described as double-edged swords. Tools which help generate modals and overlays fall into this category. They can boost your conversion rate to unprecedented numbers but they can also drive your rate to the ground. Both outcomes are blazingly fast and of course highly effective. How can you distinguish what's best and what's worse, though? "Do I manipulate my users or do I guide them?". What is the distinction between guidance and manipulation? You might be thinking now that there are occasions for which the answer to this question isn't as crystal clear. Yet, it still is crystal clear because pure guidance does not contain even a hint of manipulation inside it. You have to be absolute because there are really no middle grounds. Bear in mind that the visitor of your website knows why he is in it in the first place and he appreciates any practice of guiding him towards his goal as fast as possible. Do not obstruct your visitors flow with overlays and modals that do not help him complete his purpose of visit! You are trying to manipulate him into going somewhere he doesn't want to go, an act which will eventually push him to leave and most probably never come back. For the webmasters who use such patterns, our Engage Box subscribers included, consider the following examples of correct and helping use cases which not only guide your visitors but they also do it faster than normal. Use Slideup Boxes for notifications related to your visitor's account. For example, messages from other users or error messages from the system itself. It helps them build a continuous interaction with your website which in turn converts them multiple times over time. Use Transparent Splash Screens to inform them that they have just bought an item which in turn won them something unexpected. It creates the feeling of winning which is a much sought after attitude from your visitors. If they keep winning in such spectacular way, they'll keep trying to win more and more. Isn't this how digital gambling works? Use Twitter or Facebook Like Boxes when you have set up a contest and this is the way for them to enter. That contest was set up to create leads and leads are a precious resource to increase your clientele. Use Exit Intent Fullscreen Messages to offer them a discount or a gift to get them to stay. It won't create a bitter feeling if their experience was not bitter beforehand. It's a win/win situation. Use Boxes for Cookie Law Notices or Age Verification Purposes to show that you are credible and lawful, hence more trustworthy. There's no explanation needed for this use case, in a web full of scam artists lawfulness brings forth the feeling of security. Use well-timed popups on any situation that you can ballpark a time period after which your visitor can use the info you just gave him with your popup rather than dismissing it from the start. This way you are adding value to your content rather than making it unrelated by using popups that obstruct it immediately. 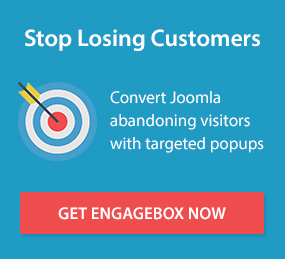 Your Conversion Rate stays high if you stop being aggressive with your popups and overlays. Guide! Don't manipulate! Those use cases are only a small sample of what you can do with tools like Engage Box and drive your conversion rate higher and higher. Notice that they all have a common denominator, they guide the visitor towards his actual purpose. They don't manipulate them into creating new purposes because more than not these new purposes are a cause for them to leave your website and never come back again.